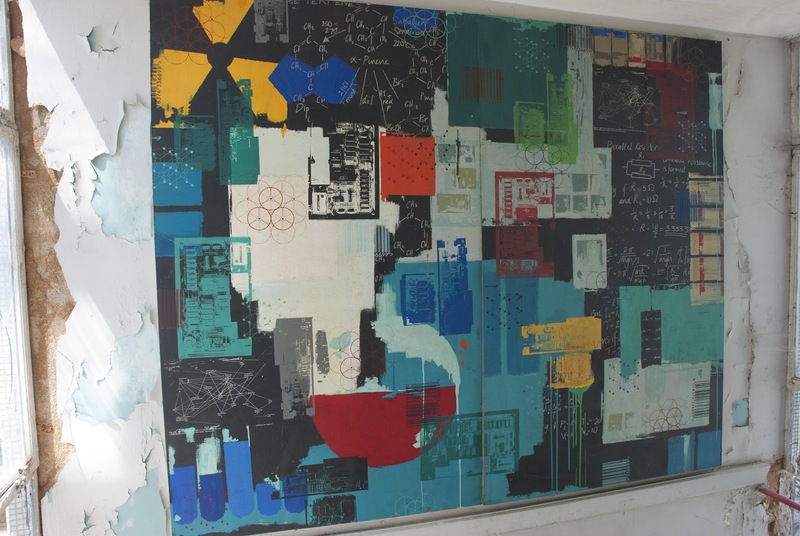 The science, mathematics and technology-themed artwork. Sitting quietly amongst the wreckage of the old Swindon College, unnoticed, undamaged, were a few pieces of treasure. As briefly blogged about back in May, the stairwells of the main building had a piece of artwork on each half-landing. I don't know how long they'd been there, but I remember passing them on the stairs in 1999. The music-based artwork can just be seen at the top of the stairs. Sitting on pieces of plyboard, around 5 feet in height, the majority were in the main stairwell of the main block. 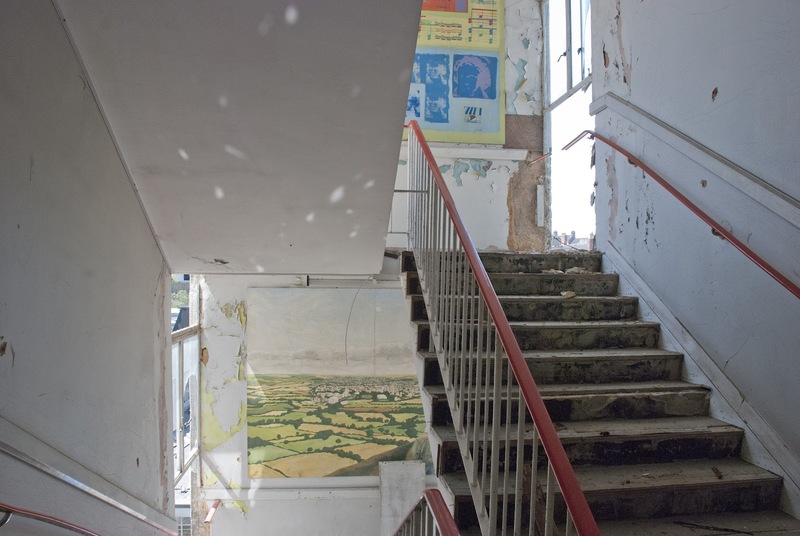 A large landscape of Swindon was especially striking, with another being a collage of mathematic equations, chemistry symbols and scientific drawings. Another was music-based, with musical notes on sheet music and portraits. Does anyone remember the artwork? I had intended to try and save them and possibly find a home for the pieces, but they were taken down in the stripping-out of the college. However, all was not lost. One piece, an abstract work created by a student was deemed good enough for a staff member to have it on the wall in an office on the 3rd floor. While on a site visit, I carefully carried it across the glass walkway between the main block and tower and edged down the crumbling stairs, passed the pieces that were not to be saved. In a large clip-frame, I carried it through town and took it home. It sits safe and saved. An often-asked question is, what would you save in a fire? What single, or handful of items would you drag out to safety. Maybe the question for some should be, what will you save from the regeneration? On demolition and construction sites workers often have the pick of items left behind or the few highlights poking from a skip due to go nowhere but landfill. So amongst the faceless and everyday pieces of administration stuck behind empty filing cabinets and yellowing memos pined to noticeboards, the kings of these forgotten artefacts hung proudly on the walls, giving flashes of colour, creativity and the legacy of the college that will long outlive these pieces we lost in the rubble. I’m a bit late coming across this, but my friend Neil Burbridge found this post recently and told me about it. We were two of the 5 BTEC HND illustration students who back in 1993/4 created the large scale artworks that feature in this blog post. I created the science/maths artwork that features in the first picture and Neil created the music artwork that you can see the bottom right corner of in the 2nd image. The landscape image that you can see in the 3rd image was created by Warren Day. I can’t remember who created the two other images. 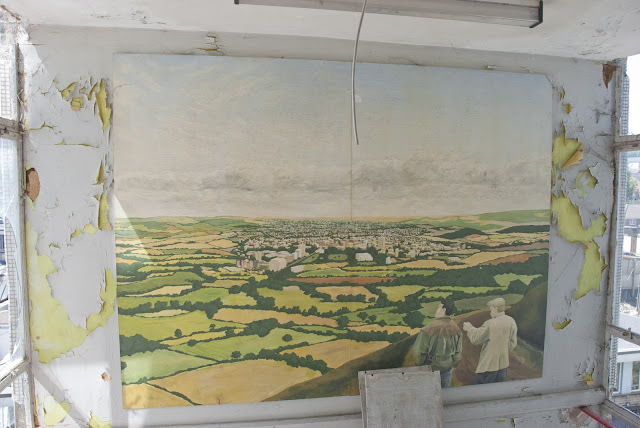 Thankfully I have a photographic record of the mural I created, but it’s interesting to see how well it was preserved some 13 years later just before the demolition – especially with the surrounding wall looking so battered! It would be interesting to know if anyone did manage to rescue them in time, but I’m thinking probably not as they were generally too large for easy transportation. It's great that the artists of the piece have found this post and pictures! The pieces were in excellent condition when I was at the college from 1999 - 2001. When we began going onsite to photograph, they were in the same condition and right before demolition (when the above photos were taken), despite the stripping of the building and frequent access by vandals, they remained untouched. Even with the removal of the side windows and walls, the weather hadn't damaged them. I tried to get them removed and taken over to Artsite at Theatre Square, but unfortunately, there was a change in staff on the site and by the time we returned we last saw them in pieces at the bottom of a massive sodden wood pile in the car park by the workshops at the back waiting to go for recycling. I'm glad I photographed them when I did! 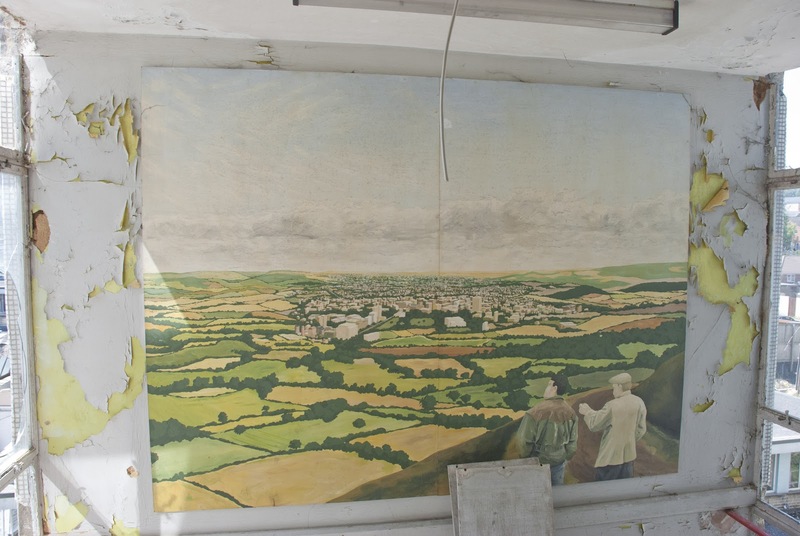 I remember the photos taken of the art works in the stairwell - the landscape painting seemed to me to be that of two men correctly predicting that all the land around Swindon would eventually be covered in houses and concrete. I taught in the college for a few years and left in 2003. That stairwell was not used much by students and I often paused to admire the paintings. I would have liked to see them preserved but I can understand that history preservation has not been a priority in Swindon. Well done to Warren Day and the other artists and thank you to Jon Ratcliffe for preserving the images on his blog.